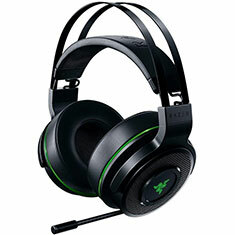 The Razer Thresher for Xbox One is the complete dongle-free wireless audio solution. On top of delivering lag-free audio immersion, this premium headset also focuses on undisputable comfort. Lined with leatherette, the lightweight memory foam ear cushions rest perfectly against your head, giving you a natural feel that is second to none. The in-built quick control buttons and a retractable digital microphone provide you with instant access to game and voice balance as well as volume even in the heat of battle.